Back in May, Google code revealed a possible HTC Nexus device in works, one that most figured would be a tablet since it ran NVIDIA’s Tegra K1. We weren’t sure if the device would be called Nexus 9 or Nexus 8, but did know at the time that it would carry two code names of “flounder” and “volantis” that everyone should be on the lookout for. Thanks to a new report that surfaced over the weekend, we may have a better grasp on the name, a full set of specs, and price points depending on the amount of storage. So what do we know now? Well, the image above is nothing more than a mock-up based off of a render that may or may not be the actual device, since the description doesn’t match-up to the device pictured. Because according to this report, the device has an 8.9-inch (2048×1440, 281ppi) display, NVDIA Tegra K1 64-bit processor, 2GB RAM, 16/32GB storage options, WiFi or LTE models, 8MP OIS camera on the back, 3MP camera on the front, front-facing speakers, and an aluminum zero-gap body. See, it’s that “aluminum zero-gap” reference that would lead us to believe that the image isn’t fully resembling an HTC Nexus. The device pictured looks like a Nexus 5 mixed with a Nexus 7, which means no metal or front facing speakers. Then again, an HTC-made Nexus device could carry similar styling to the current Nexus line, so we’ll try to keep an open mind with the potential appearance of the Nexus 9. 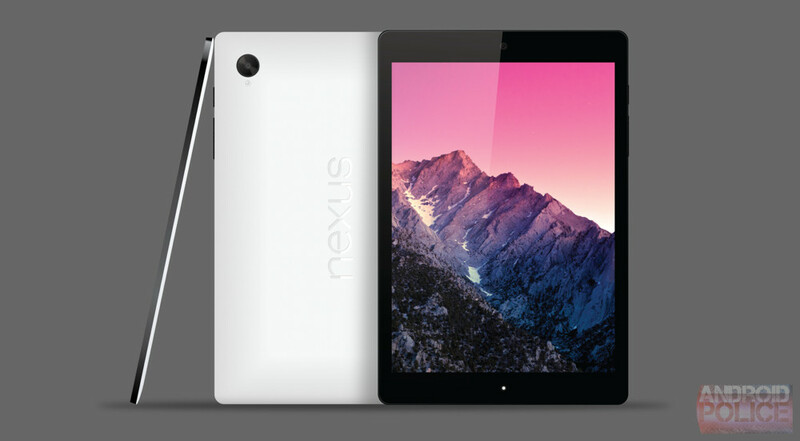 Speaking of Nexus 9, that is the name currently being used internally. We are also hearing of a starting price point of $399 for 16GB of storage and WiFi-only connectivity, followed by $499 for the 32GB model. LTE models could run north of $600. This most recent report suggest that this device isn’t arriving until Q4 with the release of the “L” version of Android, so it doesn’t sound like Google I/O will be the place for your next Nexus. That matches up to a report we heard back in March. Is this your dream device? HTC back in the Nexus game make you smile? General thoughts?